West Ham heaped more misery on 10-man Queens Park Rangers as they held on to win at Loftus Road and keep their hosts bottom of the Premier League. Record signing Matt Jarvis gave West Ham a dream start by heading in after three minutes and Ricardo Vaz Te poked in to double the lead before half-time. 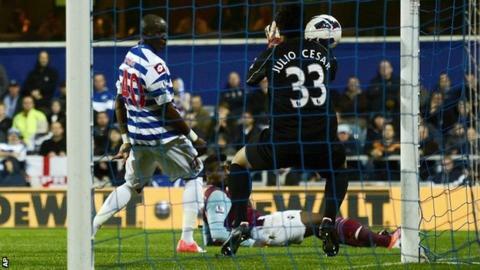 QPR rallied after the interval and Adel Taarabt cut the deficit, but the hosts had Samba Diakite sent off late on. And West Ham held on despite eight yellow cards - a Premier League record. The result, West Ham's first away win of the season, moves Sam Allardyce's side up to seventh in the table and there was more cause for optimism as striker Andy Carroll played the final 20 minutes after returning from his hamstring problem. But this was another damaging defeat for winless QPR, who have now taken only two league points from a possible 18 this season. Having been backed heavily by owner Tony Fernandes during the summer transfer window, the pressure is likely to mount on manager Mark Hughes, who will in turn point to a string of defensive injuries. Sharper to the ball and swifter to use it, West Ham dominated the opening 45 minutes. QPR finally found their rythym in the second half, inspired by the creativity and energy of Taarabt, but it was too little, too late. West Ham worked hard and counter-attacked intelligently, using the energy of Mohamed Diame and the guile of Vaz Te, but it was by no means a classic performance and both of their goals owed more to perspiration than inspiration. Their first came as early as the third minute after Vaz Te skipped beyond a desperate lunge from Clint Hill on the right. The Portuguese cut the ball back to Kevin Nolan on the edge of the area and his looping cross was headed in by Jarvis at the back post. QPR threatened in fits and starts, with Bobby Zamora firing well over from 12 yards and Djibril Cisse drawing an acrobatic save from Jussi Jaaskelainen with an athletic volley. But West Ham remained the better side and the second goal followed soon after. James Tomkins lofted the ball to the back post after QPR failed to clear from a corner and Vaz Te stretched out his right leg, with the ball beating goalkeeper Julio Cesar thanks to the slightest deflection off Stephane Mbia's arm. QPR responded to their manager's half-time words with the kind of spirit and energy that they had been lacking. Taarabt shattered the mediocrity with the game's single moment of brilliance, unleashing a fizzing 30-yarder that flashed into the top corner, 84 seconds after coming on as a substitute. West Ham's Jaaskelainen was the busier of the two goalkeepers now, saving brilliantly from Esteban Granero's shot after a clever touch by Cisse, although Carlton Cole should have made the victory more comfortable for West Ham but prodded wide with the goal at his mercy after a slide-rule pass by the tireless Nolan. But just as QPR came again, Diakite lunged in on Vaz Te to collect a second yellow card, 25 minutes after coming on as a substitute, to take the wind out of QPR's sails. West Ham manager Sam Allardyce said: "We've achieved our first Barclays Premier League away win, which is no mean feat for a newly promoted team. I think the outstanding qualities we showed, both in our ability to take the game to the opposition away from home and our ability to score goals. were fantastic to see. "As the underdogs, having just been promoted, to come to QPR and take the game to them and dominate that first half was great. If I had to say anything, I was a little bit disappointed we didn't get more than two. "There were an awful lot of fouls and decisions the referee gave that he didn't need to do and an awful lot of yellow cards he gave nearly spoilt the game."